After spending 3 days in Pangangan we headed down south by bus to Panglao, and the celebrated Alona Beach. Along the way, we stopped off at a hypermarket in Tagbilaran to stock up on goods. 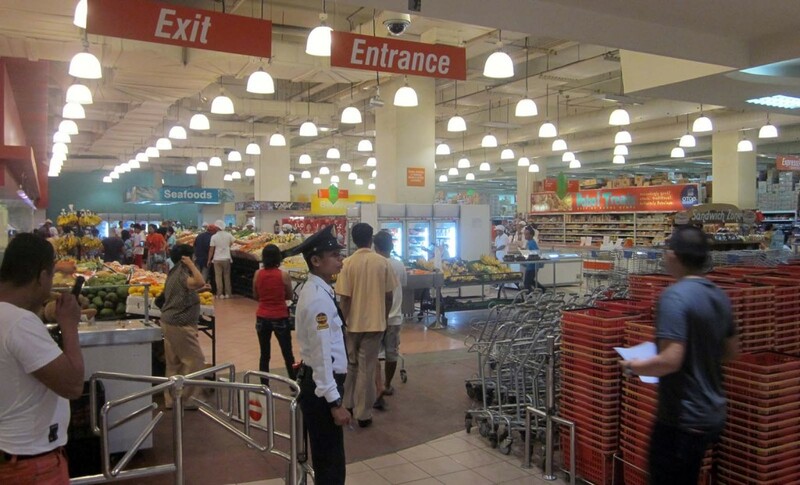 This was our first experience of a Philippines supermarket. 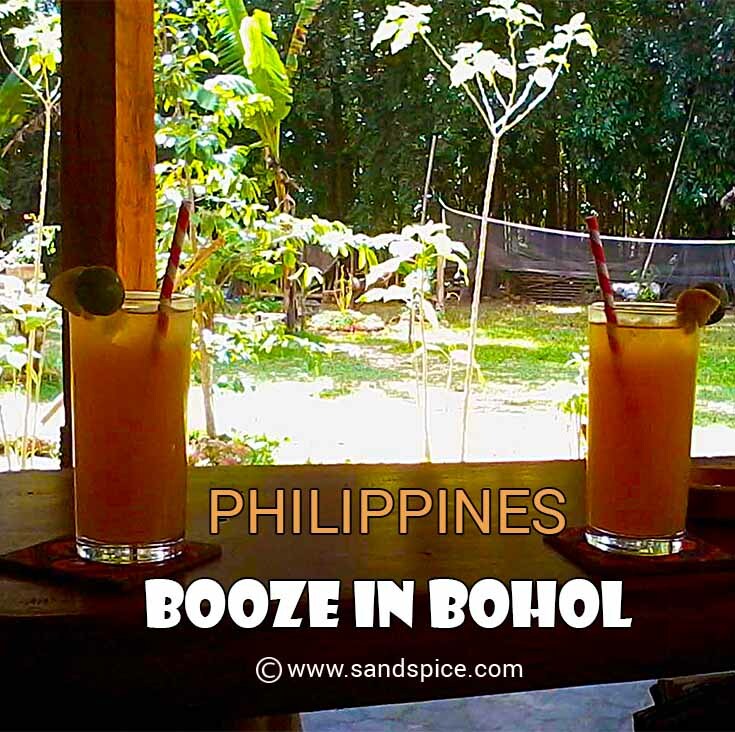 Among other items, we were curious to discover the options and prices for booze in Bohol. If you’re not careful, drinking (booze, not water 🙂 ) in the Philippines can account for a large share of your holiday budget. This is especially so if you happen to be a wine drinker. A bottle of red or white white purchased at a bar or resort will cost 500 to 600 pesos (€10-12). On the other hand, a stonking great 1-liter bottle of San Miguel beer will cost around 80-100 pesos (€1.60 to €2). For some reason, its difficult to get a really cold beer, and you often end up with something just slightly chilled that quickly becomes lukewarm. In a large supermarket, you can get a decent bottle of red or white – usually Australian or Chilean – for 200 pesos (€4), or a 3 liter box for 650 pesos (€13). We found the 3-liter box to be the best solution: It fits in your rucksack, keeps good for several days in its airtight bag, and you’re not obliged the “finish the bottle” each time you want a drink. 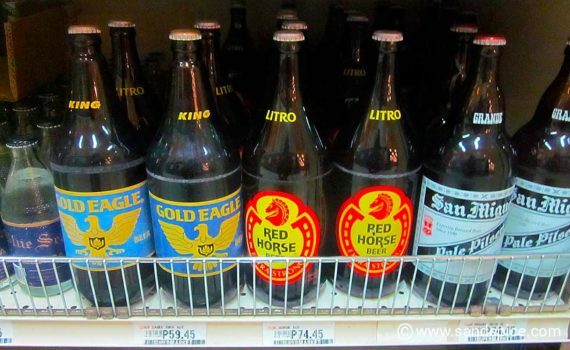 Unlike some other places in S. E. Asia, in the Philippines we were able to purchase alcoholic drinks almost everywhere. However, if you just want a decent glass of wine at a reasonable price, better to purchase one of these boxes from their super (and huge) shopping malls, and carry it with you. Regarding the shopping malls and mega-supermarkets in the Philippines, I can’t praise them highly enough. All entrances and exits are manned by immaculately-uniformed armed security guards, both male and female. They check all bags on entrance, but do so in a very professional and courteous manner. The malls themselves are impeccably clean, and are open usually from 8 am until around 10 pm or later. If you are carrying something bulky (like a rucksack) when you enter, don’t worry. 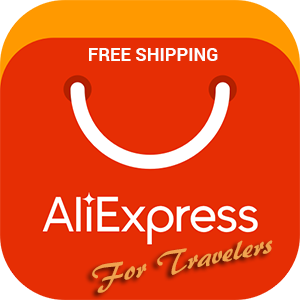 There is usually a free luggage-check service close to the main door, leaving you free to shop unimpeded to your heart’s content. The staff in the plethora of shops and eateries are equally attentive, helpful, friendly and polite: A far cry from our experiences back home in Europe. The highlights of the shopping malls for us were the supermarkets. If I lived in the Philippines, I would be spending a lot of time in these places. Fabulous selections of fresh tropical fruit – we bought as much as we were able to carry. But to return to the main subject of this article – booze. Spirits are really inexpensive in the supermarkets, and home-brewed spirits even cheaper. We had to avoid the spirits, however, and not just because of the extra weight: Our schedule didn’t allow us the time to waste nursing a hangover! This doesn’t mean we avoided spirits altogether, mind. You can’t go to Alona beach and not enjoy a cocktail while feeling the sand between your toes. 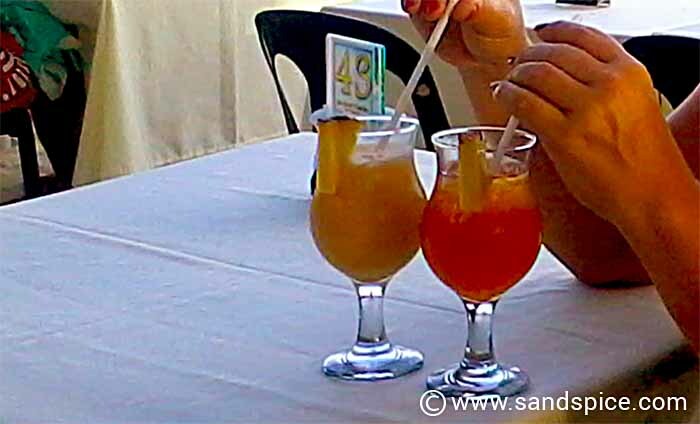 Cocktails on Alona beach cost around 260 pesos for two, with generous measures of alcohol. That’s around (€2.50) per cocktail. Very happy to uncover this website. I have you bookmarked and am looking forward to your upcoming articles. It’s still early days for our website, and I have a large backlog of articles, reviews, photos and maps yet to be published. We’re also researching our next trip to Asia, and will share this information from the very early planning stages.